Sometimes, the best bikes I find are those suggested to me by a friend of a friend. They hidden treasures that come up in conversation that you only find by chance. The bike on these pages happens to be one of those finds. You just love it when you hear those magic words, “Hey, you have to see my buddy’s bike! It’s killer”. I usually torture myself and reply sure, send it my way. 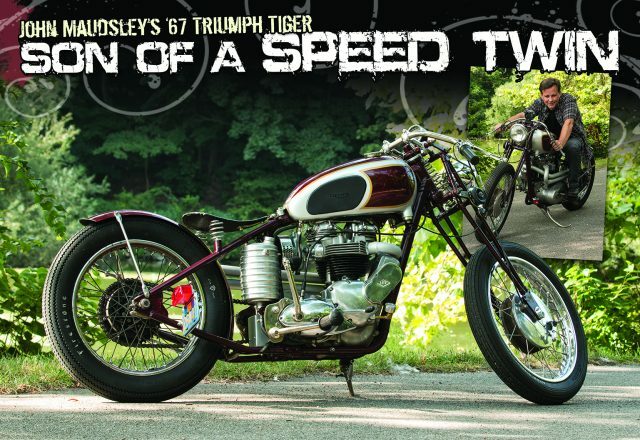 Good thing for me this time or I never would have run into John Maudsley and his ‘67 Triumph Tiger. 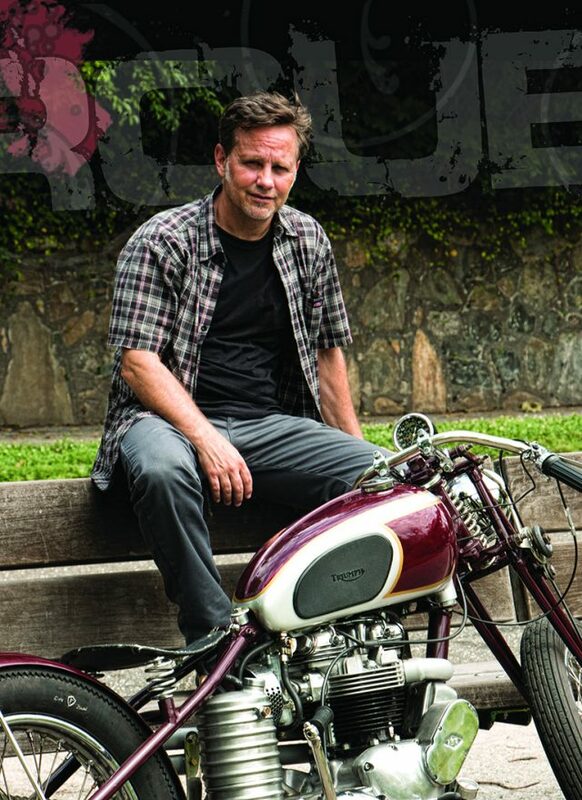 The bike pictured is not the bike John started with. Back in 2004 it started as a Craigslist ad that listed a ’67 Triumph Tiger basket case. John was familiar with Triumphs. He had a twin carb Bonnie for years that had recently been sold. 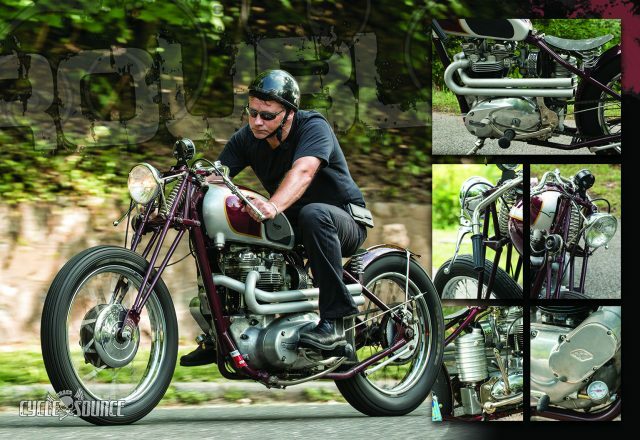 When John decided to go have a look, he thought maybe he would build a single carb bike. He figured it might be less of a hassle to keep tuned and running. Well, it was in fact a ‘67 Triumph, however, it was in several boxes and milk crates, but it was all there. The motor was half apart; with some work having been done on it. It had not been registered in many years but there was an expired transferrable registration which went with the bike, which was a plus. A fair deal was struck and the frame and boxes of parts were dragged back to the city where the sorting would soon begin. John had traveled to hundreds of car and bike shows all over New York and the rest of the country. He had a vision for this bike, one that had been floating around in his head for a very long time. He didn’t necessarily want it to fit any specific genre like “bobber” or “café racer”, or “chopper” but wanted small pieces of all of them to be included. He was always fascinated with the ’38 Triumph Speed Twin. Since his chances of ever owning one were between slim and none, he decided he would set out to make a modern day, affordable tribute to that bike. In his head, if he was to go forward with this project there were a few things that the bike absolutely had to have. It had to have a Magneto and it needed to have either a springer, or a girder front end. It took some time to gather the pieces from several different sources and the bike went through several mock up design stages but eventually it all came together. The e-Bay girder (of unknown origin) front end had to have some pretty severe internal modifications in order to make it work; it was a bit too short for the Tiger. The ARD Magneto is a belt drive unit which tucks into the front of the motor (as opposed to sticking out like most other mags do). Back in the day, these were mainly seen on Flat Tracker and Drag Race bikes. He started out with a hard tail section that he bought from a retail supplier but it just didn’t fit the look he wanted so a hand-made rear tail section was fabricated, stretched and shortened in all the right places so any empty space was limited and the overall look was just right. Only the axle plates were saved. John was never a fan of those long tail sections you see on many Triumph rigid bikes (along with them usually come chain tensioners, exposed batteries and unsightly wiring, etc.). Short and tight was the look he liked with nothing on the bike that did not function in some way or absolutely didn’t need to be there. One of his favorite pieces is the license plate bracket which can be tucked away when necessary, an idea that began one day while holding a universal ratchet in his hand. 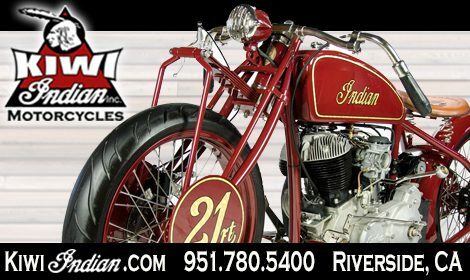 John even sourced the original (correct) paint for a ’38 Speed twin, Amaranth Red and then pinstriped the borders with the (also correct) gold himself. In the end, the chrome base on the tank just wasn’t do-able but that’s what should have been there to replicate the original paint scheme. Plating in these parts has seemed to become nearly impossible. He never wanted the bike to be a showpiece or trailer queen, he prefers that it looks like what it is, a functioning bike. Many of the pieces on the bike are hand made from stainless steel then nickel plated. Cloth type vintage style wiring and a Smith’s “Rev-u-lator” and a piece cut from of one of his old leather jackets was salvaged to wrap the seat which completed the package. Between work and family, John doesn’t get to ride as much as he would like, but when he does, this made to ride bike draws attention just like those built by the masters. It is great to know that just when you think you’ve seen them all, there is always someone like John to prove you wrong and give you the hope that there are still some hidden treasures out there to be found. 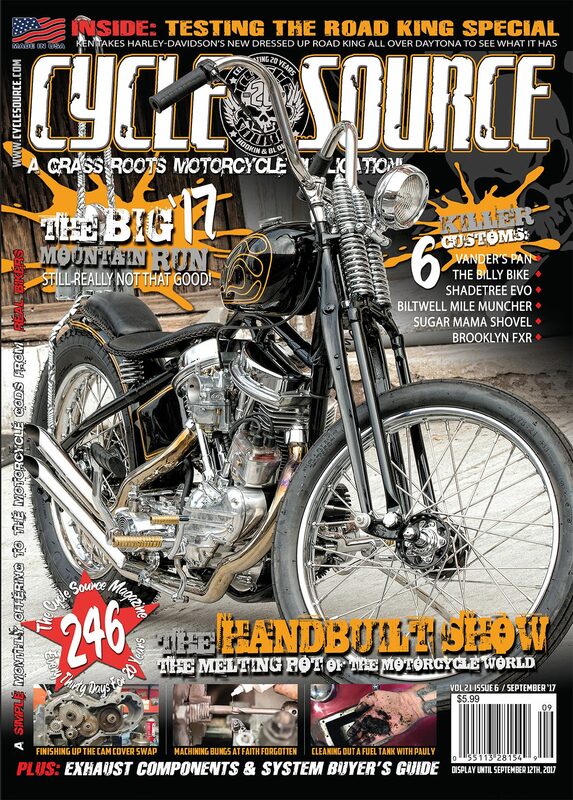 This entry was posted in Feature Bikes and tagged Back Issue, Cycle Source, Cycle Source Magazine, Feature bike, Son Of A Speed Twin. Bookmark the permalink.